490 W. Bogdanowicz and R. D. Owen INTRODUCTION The tribe Plecotini (Chiroptera: Vespertilionidae) consists of 10 or 11 species of mainly "long-eared" bats, that are widely distributed throughout the Holarctic (e.g., Yoshi- yuki, 1991; Frost and Timm, 1992; Tumlison and Douglas, 1992; Zima et al., 1992; Qumsiyeh and Bickham, 1993). Handley (1959) first examined the relationships among the tribe in detail and proposed the phylogeny (Barbastella (Euderma Plecotus)). His taxonomic arrangement included the genera Barbastella, Euderma and Plecotus, with the last contain- ing three subgenera: Plecotus of the Old World, and Coiynorhinus and Idionycteris of the New World. Subsequent works suggested that Idionycteris should be given full generic status (Williams et al., 1970; Nader and Hoffmeister, 1983) on the basis of a closer relationship between Idionycteris and Euderma (Stock, 1983). Yet, Handley's (1 959) arrangement is still generally accepted (reviewed by Frost and Timm, 1992; Tumlison and Douglas, 1992; see also Menu, 1987; Topal, 1989). Recently, though, three different classifications of the Plecotini have been proposed based on cladistic treatments of moiphological and chromo- somal traits. Tumlison and Douglas (1992) examined 32 cranial and external characters. These data yielded the most parsimonious tree (Barbastella (Corynorhinus (Plecotus (Idionycteris Euderma)))). Frost and Timm (1 992) used transformation series of 25 morpho- logical and 11 karyological characters to propose the phylogeny (Euderma [including Idionycteris] (Barbastella (Plecotus Corynorhinus))). Studies of G-banded chromosomes (Zima et al., 1992; Qumsiyeh and Bickham, 1993; Volleth and Heller, 1994) indicated the phylogeny (Euderma Idionycteris (Otonycteris Barbastella Plecotus Corynorhinus)). Re- cent advances in geometric morphometrics provide systematists with potentially powerful tools for testing evolutionary patterns and processes (e.g., Tabachnick and Bookstein, 1990; Rohlf, 1993a; Rohlf and Marcus, 1993; Swiderski, 1993). These new techniques offer useful means to describe evolutionary shifts in the morphology of organisms and can provide new sets of characters with which to hypothesize systematic relationships. They also can show how anatomy, as depicted by the geometric relations between homologous landmarks, differs among populations and taxa in a way that may be related to their history (phylogeny) and ecology (e.g., Reyment, 1991; Loy et al., 1993).  The aim of this study is twofold. First, we want to assess the amount of morphological variation and resolution seen among species within plecotine bats. This will be investigated by decomposing morphological variation into centroid size, uniform and nonuniform components (Bookstein, 1990, 1991), and distin- guishing inter-taxon differences among forms. Second, we will evaluate some of the recently developed geometric methods as tools for evolutionary and phylogenetic inference by comparing our results with previously published arrangements proposed for the Plecotini. 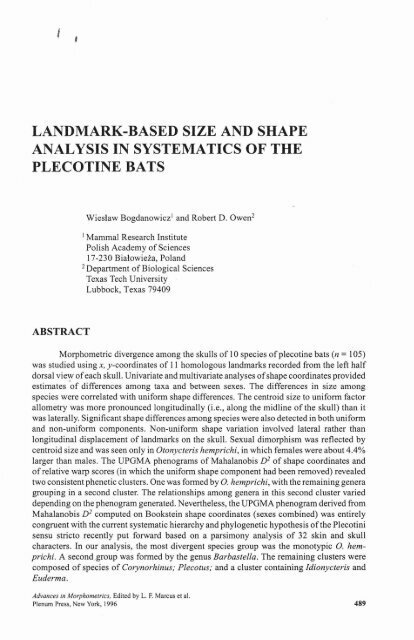 MATERIAL AND METHODS In total 105 specimens (see Appendix) representing 10 species of the plecotine bats were examined. To avoid the effect of bilateral asymmetry, 1 1 landmarks were collected from the left half dorsal view of the skull of each specimen (Fig. 1). These landmarks are (1) center of posterior curvature of internasal opening; (2) proximal extremity of premaxilla; (3) point of maximum lateral curvature of maxilla at center of upper canine; (4) center of infraorbital foramen; (5) point of the maximum curvature (width) of the infraorbital plate; (6) point of postorbital constriction inside the orbit; (7) point where internal portion of the posterior zygoma contacts the cranium; (8) most posterior internal curvature of zygomatic arch; (9) most lateral point of the mastoid process; (10) most posterior point of interparietal; and (1 1) center of coronal suture.